I like going everywhere. And I love starting new things. It's a character that I always found really likable. I'm fond of Zorro because he was a popular figure who worked for the people. A couple of years after I arrived in Hollywood, everything that was Latino was fashionable, and years after, my thought is that we're not fashionable anymore. We're here to stay. I completely take on the risk, the poker game, which being an artist means, and I'm going to try to make a film which honestly reflects what I have in my head. In 1996 Banderas appeared among other figures of Spanish culture in a video supporting the Spanish Socialist Workers' Party lists in the general election. The film's success earned Banderas wide recognition and the following year was given a role in Neil Jordan's high-profile adaptation of Anne Rice's Interview with the Vampire which allowed him to share the screen with Tom Cruise and Brad Pitt. Banderas' debut as a director was the poorly-received Crazy in Alabama (1999) starring his wife Melanie Griffith. 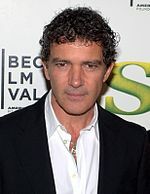 Banderas is also a voice artist portraying the voice of Puss in Boots in the Shrek sequels and Puss in Boots as well as the bee in the US Nasonex commercials. José Antonio Domínguez Banderas (born 10 August 1960) better known as Antonio Banderas is a Spanish film actor film director film producer and singer.